Adrian Beltre is a notorious baseball jokester—he pranks teammates, plays tricks on opponents, and even barbs with umpires, falling prey to the infamous Gerry Davis on-deck circle ejection in July 2017, and serving as the subject of Joe West's three-game suspension in August. Related Post: MLB Ejections 109-110 - Gerry Davis (1-2; Beltre, Banister) (7/26/17). Related Post: Source - Joe West Suspended 3 Games for Beltre Comment (8/8/17). Is this an example of obstruction or is it legal? But did Beltre go too far with one of his just-fooling-around antics on Tuesday evening? The Play: With one out and two on (R1, R2) in Oakland, Athletics batter Chad Pinder hit a ground ball to Rangers shortstop Elvis Andrus, who threw to second baseman Rougned Odor to force baserunner R1 Marcus Semien as lead runner R2 Jake Smolinski jogged to third base. Hoping to catch Smolinski off-guard, Odor threw to Beltre, the throw getting away from the Rangers third baseman, who appeared to wrap his arms around R2 Smolinski before running to retrieve the baseball as 3B Umpire DJ Reyburn looked on. Smolinski appeared to momentarily break for home plate, but ultimately remained at third base for the remainder of the play. Case Play Question: Did Beltre commit obstruction when he held Smolinski? If so, what manner of obstruction is this (Type 1/A or 2/B) and what is the proper result of this play? Refer to the obstruction rules and apply the appropriate penalty (if applicable) to assist in your response. Timeline of Obstruction for this play. Case Play Answer: Briefly putting the cart before the horse, let's discuss whether this play would qualify as Type 1/A or 2/B obstruction before determining whether this was obstruction at all. As the accompanying graphic indicates, if Beltre obstructed Smolinski while shortstop Andrus was throwing to second baseman Odor, this would be an instance of Type 2/B obstruction, with no play being made on the runner. If the obstruction occurred while Odor's throw was in flight toward Beltre, Type 1/A would apply. After Beltre failed to catch the throw, the class of obstruction refers back to Type 2/B. As for determining whether this is actually obstruction, we consider whether Smolinski's progress was actually impeded. At first glance, Smolinski appears to be holding the base, so no progress is impeded and no obstruction has occurred. Shortly thereafter, Smolinski makes a motion toward home plate that appears voluntary, meaning that Beltre's wrap-up maneuver is now impeding Smolinski's progress. This entanglement is thus obstruction of the type 2/B variety. The penalty for obstruction 2/B is that which will nullify the act of obstruction. In this situation, given the runner, ball, and fielder's position, it is doubtful Smolinski would have tried for home plate absent the obstruction—perhaps had Smolinski immediately broken for home upon the missed catch, an argument could be made, but with the delayed reaction, it is evident he likely would have remained at third base. Thus, in the end, the result of the play was correct: Smolinski stays at third. 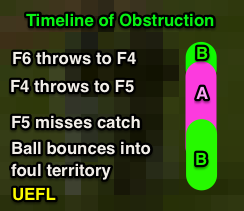 Pitfall: The term "fielder's immediate reach" sometimes comes up when talking about obstruction plays. This is not one of those times. Immediate reach only applies to a batted ball, when the fielder has right of way privileges up until the batted ball is missed. As long as the ball is in the fielder's immediate reach, even if technically behind the fielder, the runner must avoid the fielder lest interference be called. Once the ball is no longer in the fielder's immediate reach, similar contact could result in an obstruction ruling. Related Post: Obstruction 1 or A vs 2 or B - The Difference is Crucial (6/23/17). OBR [Definition of Terms]: "OBSTRUCTION is the act of a fielder who, while not in possession of the ball and not in the act of fielding the ball, impedes the progress of any runner." 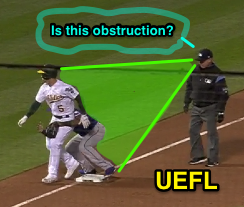 OBR 6.01(h)(1): "If a play is being made on the obstructed runner, or if the batter-runner is obstructed before he touches first base, the ball is dead and all runners shall advance, without liability to be put out, to the bases they would have reached, in the umpire’s judgment, if there had been no obstruction. The obstructed runner shall be awarded at least one base beyond the base he had last legally touched before the obstruction. Any preceding runners, forced to advance by the award of bases as the penalty for obstruction, shall advance without liability to be put out."